Here’s another chapter out of Mangas & Videogames, goes by the name of 64. In this chapter, Ryu, Ken, and Chun-Li fight Goku, Vegeta, and Piccolo for the right to get a fighting game on the N64. 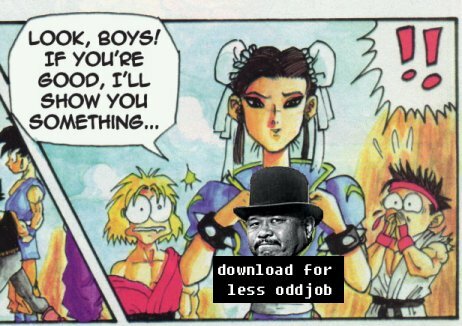 Well, Chun-Li is more of a lover than a fighter in this one. Also features some cameos by other characters on the last page. This entry was posted in Mangas & Videogames and tagged m&v, spanish, street_fighter. Bookmark the permalink.